The new year inspires reflection and resolutions. We take stock of the last twelve months noting the highs and the lows. We may have regrets about opportunities we did not pursue, projects we didn’t get to, students we could not reach, and activities we wish we had dedicated more time to in the last year. Often these feelings about the year inspire lofty new year resolutions. A few of us may stay committed to these resolutions, while others quickly fall into the habits of the previous year. Perhaps our resolutions are too extreme and demanding which makes them unsustainable. Perhaps the pull of our old habits and routines is too strong, and we return to what feels comfortable, if not entirely fulfilling. I have rarely made dramatic new year resolutions that pertain to my personal life. I know I’d like to be more present with my children when I am home. I need to get to the gym more days a week to stay physically and mentally healthy. I would love to read more. I want to carve out time for me in the craziness of my life. These are goals I am always working on and making progress toward in my personal life. When it comes to my professional life, I like to identify something specific that I want to achieve or work toward. This year, my resolution is simple. It was inspired by a comment my friend, Colt Briner, made during a conversation we had about education. He said it is important to “do what lights you up.” His comment resonated with me on a deep level. When we do what lights us up, we are pursuing our passions, we are blissfully immersed in our tasks, and we feel deep satisfaction and joy in our work. This is what I wish for myself, my children, my students, and the teachers I work with. Do what lights you up this year! Invest your time and energy in the aspects of your job that you are passionate about. When faced with the aspects of your job that are challenging or draining, reimagine how those tasks might be tackled differently. For example, two years ago I decided that my new year resolution would be to move all assessment into the classroom. I was exhausted by the massive amounts of grading I was taking home each week. I realized that this aspect of my job was draining me of energy, so I decided to rethink grading. I knew I could use blended learning models to create more time and space in the classroom to provide real-time feedback and conduct side-by-side assessments, but it was going to require me to think outside of the box. It was the best decision I have ever made as a teacher. Not only did I stop taking grading home and used my creative energy outside of class to design learning experiences, but my students were more invested in learning. So, I challenge other educators to spend 2019 doing what lights you up! What aspects of your job do you LOVE? How can you spend more time and energy doing that? How will investing in the aspects of your job that you are truly passionate about impact your students? Feel free to post a comment and share your thoughts to help other educators get excited about their work in 2019! 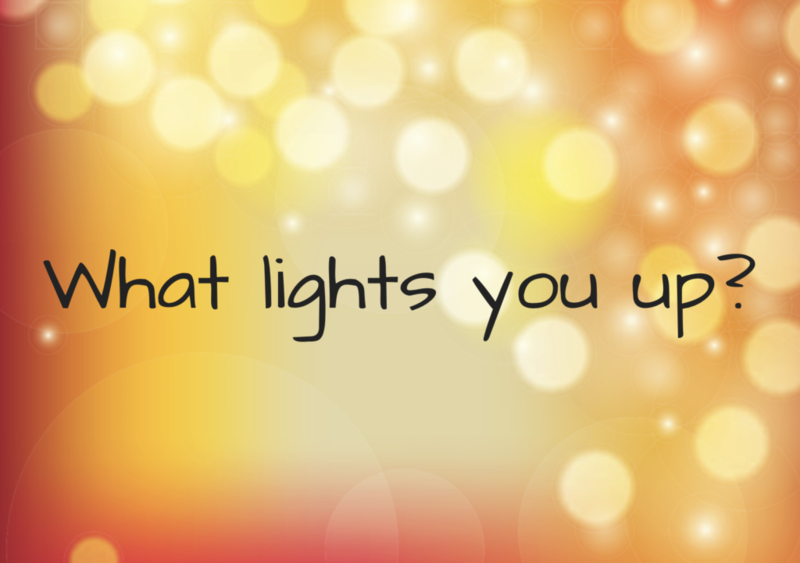 3 Responses to Do What Lights You Up This Year! I love that you did this with your kids, Cathy! I also appreciate you sharing their AWESOME slide deck. Seeing their responses made me smile. I am glad you are spreading the word. This is such a great exercise for teachers and students!